There are a total of five unique Mounts that can drop during the Horde controlled Arathi Highlands warfront event. This article will show you the location of each rare that drops a mount, which mounts they drop, and the best route to take to farm them. Aside from one mount, both the Horde and the Alliance can receive the same mounts from the same rares. 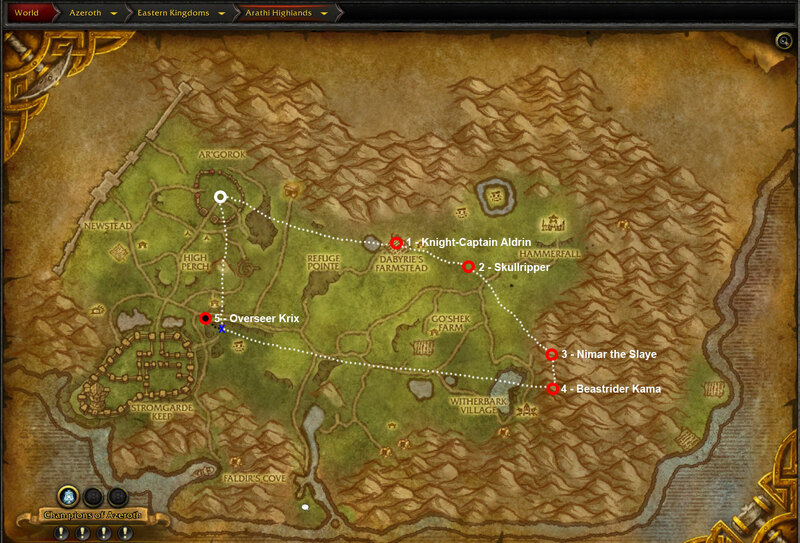 As the location of the rares can be different for the Alliance, we have also made a map just for them. After the Alliance have been driven out of the Arathi Highlands, Knight-Captain Aldrin can be found in the Dabyrie’s Farmstead. By defeating him, there is a chance that he is dismounted and his steed, the Broken Highland Mustang is taken as you own. This red raptor can be found patrolling around a large rock. By bringing her down, you might be able to tame her, making Skullripper your new mount. Riding a top his giant bat, Nimar the Slayer could be dismounted when defeated giving you a new flying mount, the Witherbark Direwing. Beastrider Kama patrols the Witherbark Village. Succeed at dismounting him, and you just might get yourself a Swift Albino Raptor of your own. You may have noticed that Overseer Krix’s location is indicated differently from the rest. This is because unlike the others, he is located underground in a mine. To reach him, access the mine via the entrance shown by the X. This kobold wanders around the mine, but can usually be found in the main chamber. Defeat him and you might get lucky enough to acquire his steed, the Lil’ Donkey.